the Springs 3 Theatre showed ‘The Last Temptation of Christ.’ A local lady appealed to the theater manager not to show the movie. He declined her request and she responded with, “Then we will pray that this theater goes out of business.” Amazingly, six months later it closed. Students from Grace Presbyterian church began to talk about what a great place the theater would be as a location for youth ministry. So they gathered weekly to join hands around the theater and pray. Even local police would stop and pray with them. Eventually a donor stepped forward and the building was purchased by a tax exempt youth ministry. But within a few weeks, the leaders recognized that for student ministry to be successful, it needed to be part of a church. Thus, the original name of the church (CenterPoint Community Church) was born. 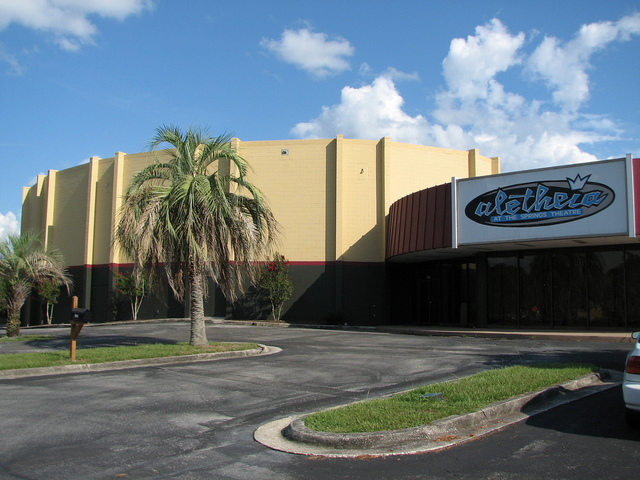 The movie theater was repurposed and slowly renovated in order to be usable for the new effort. First Christian Church Meeting Hall – the current home of Redeemer Community Church! Redeemer Community Church is born! The vision of our church is to be a place where believers and unbelievers can wrestle with the implications of the Cross of Christ, make Him the foundation for life and relationships, and pass the knowledge of Him to the next generation. The updated church name clarifies the emphasis of changing our hearts, the beautiful new work within the church and aids our re-plant in creating a fresh start. We are a community of broken, forgiven, and renewed people who need the gospel every day – a Redeemer Community!